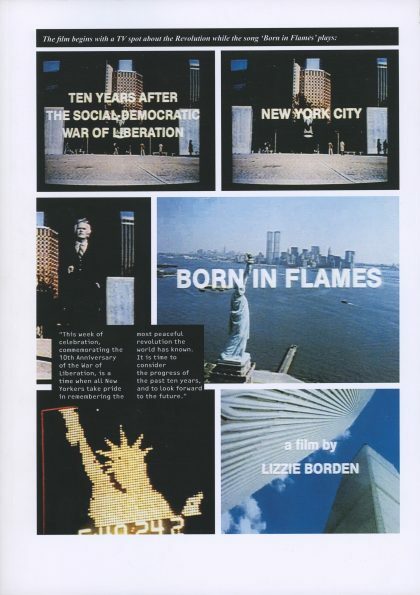 Born in Flames – the publication – is the complete authorised graphic translation of Lizzie Borden’s mythical 1983 film Born in Flames. Kaisa Lassinaro’s post-facto screenplay captures all the political energy and visual brilliance of Borden’s film, which describes a futuristic society (eerily similar to our own) where the achievements of a past revolution are threatened by reactionary sexist forces. 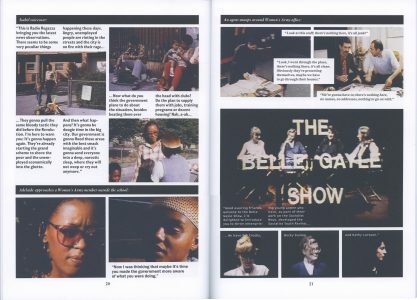 The published version of Born in Flames allows for a frame-by-frame analysis of the film’s complex plot and soundtrack, with songs by The Bloods and Red Crayola. Included is an interview with Borden conducted by Lassinaro, in which the filmmaker looks back on the making of her film. 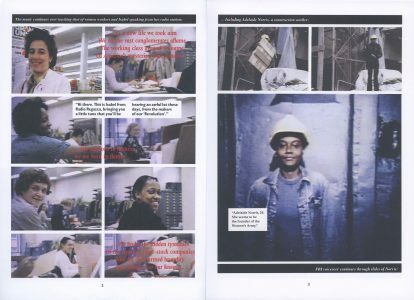 In the spirit of Borden’s film, the publication was collectively funded by the following individuals and institutions, to whom we extend our warmest thanks: Stuart Bailey, Heather Bradley, Eleanor Brown, Geoffrey Brusatto, Culturgest, Wayne Daly, Chris Evans, Beatrice Gibson and Nick Gordon, The Hawthorne Archive, Erna Hecey, Onno Hesselink, Will Holder, Jeff Khonsary (Fillip), Koenig Books, Uriel Orlow, Falke Pisano, Philomene Pirecki, PrintRoom; Karin de Jong & Ewoud van Rijn, Pro QM, David Reinfurt, Jane Rolo, Catherine de Smet, Benjamin Thorel, Giulia Vallicelli, Julia Zay. And thank you to all those who placed pre-orders: Xavier Antin, Aline Bouvy, Lan Camille, Vincent Chan, Céline Condorelli, Daniel Eatock, Aurélien Froment, Yannick Gallepie, Fiona Hogg, Eduard Barcelon Juve, Johanna Kaaman, Adrian Lambert, Anette Lux, Project Projects, Benjamin Reichen, Irene Revell, Jérôme Rigaud, Maria Isabel Damunt Romero, Jérôme Saint Loubert, Salome Schmuki, Natasha Soobramanien, Jessica Speer, Maki Suzuki, Chris Svensson, Regis Tosetti, Eva Weinmayr, Luke Williams and Caroline Woodley. 210 × 300 mm, 48 pp.